Barnafoss is also known as Bjarnafoss, which was its previous name. Barnafoss is near Hraunfossar which burst out of Hallmundarhraun lava plain. 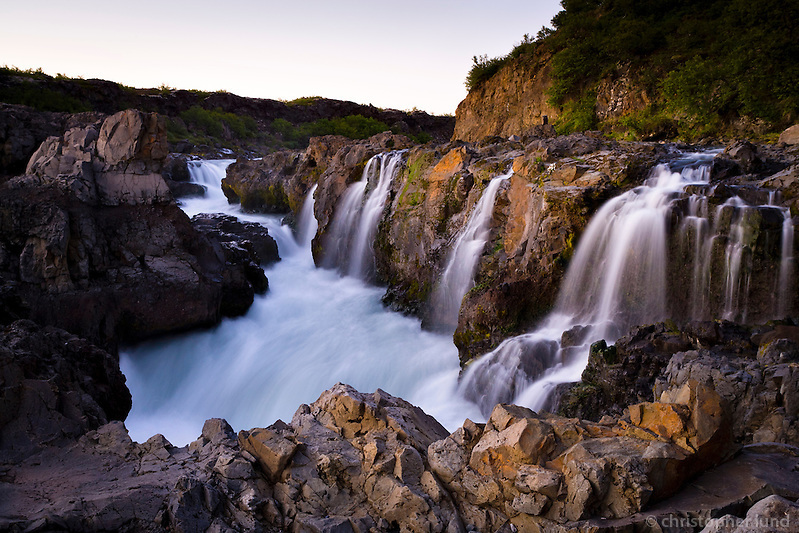 Many Icelandic folk tales have been associated with Barnafoss, the most famous being about two boys from a nearby farm, Hraunsás. One day, the boys parents went with their ploughmen to the church. The boys were supposed to stay at home, but got bored and decided to follow their parents. They made a shortcut crossing a natural stone-bridge that was above the waterfall. On their way over the stone-bridge, they fell into the water and drowned. When their mother found out what had happened, she put a spell on the bridge saying that nobody would ever cross it without drowning himself. A little while later, the bridge was demolished in an earthquake. Posted on Wednesday, March 23rd, 2011 at 23:35. Filed under: Locations, West Iceland	RSS 2.0 feed.